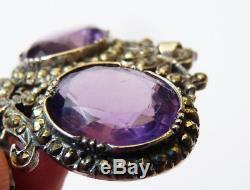 It is in solid silver violet stones are amethysts. Small stones are marcasites or pyrite. Punch little legible (but it's good money). Dimensions: 5.2 x 3.3 cm. 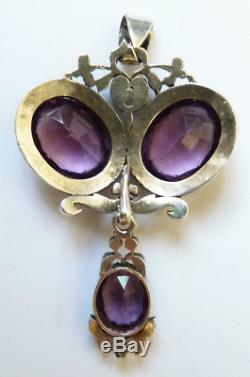 Jewel of the late 19th century. Hand delivery possible paris 9th. 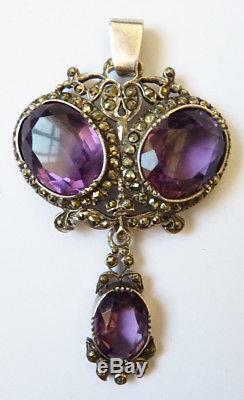 The item "sterling silver pendant and amethyst + marcasite jewel old 19th century" is on sale since Sunday, September 30, 2018. It is in the category "art, antiquities \ objects of the nineteenth and before". The seller is "dessinoriginal" and is located in / in paris, ile-de-france. This item can be delivered anywhere in the world.